Komisi Nasional Hak Asasi Manusia Republik Indonesia - Komnas HAM is the National Commission on Human Rights of Republic of Indonesia. Komnas HAM is the national human rights institution of Indonesia which was formed to protect and promote the human rights in Indonesia. Komnas HAM was officially established in 1993 based on Presidential Decree No 50 of 1993. 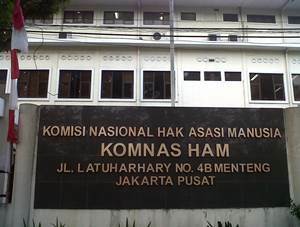 Komnas HAM is based in Jakarta and its head office is situated in Jl Latuharhary No 48 Menteng Jakarta Pusat. According to Komnas HAM's profile as cited by JobsCDC.com, Komnas HAM now has 6 representative offices spread in all over Indonesia; Representative Office of Aceh, Representative Office of West Sumatera, Representative Office of West Kalimantan, Representative Office of North Sulawesi, Representative Office of Maluku, and Representative Office of Papua. Due to strengthen its team, Komisi Nasional Hak Asasi Manusia is pleased to announce the following vacancies for immediate recruitment. Male / Female, age at least 18 years and maximum 28 years. Minimum 1 year of experience in the field of protocol or secretary. Fluent in English both active and passive. Diligent, thorough, friendly and cooperative and have a working initiative. Female, age at least 18 years and a maximum of 25 years. Minimum SMA or equivalent, with the minimum Average Value of diploma / STTB of 7.00. Minimum 1 year experience in the related field. Have a good understanding the ordinances of service, diligent, thorough, friendly and cooperative as well as have a working initiative respectful and ethical. Minimum 1 year experience in the field of Reception. Have a driving license class A (SIM A) and familiar with the area of Jakarta and its surrounding. Good character as evidenced by Police Notes (SKCK) of Police Resort (Police) local. JobsCDC.com now available on android device. Download now on Google Play here. Please be aware of recruitment fraud. The entire stage of this selection process is free of charge. Komisi Nasional Hak Asasi Manusia - Recruitment SMA, SMK, D3 Non CPNS Komnas HAM October 2016 will never ask for fees or upfront payments for any purposes during the recruitment process such as transportation and accommodation.